Figuring out ranks, rates, and pay grades in the military among all the different branches can be somewhat confusing. As you get more familiar with the charts of each service describing the ranks and insignia used to represent certain ranks, rates, and pay grades, you will see each service has its own system. The U.S. military has specific terms to denote authority and responsibility, and these terms vary depending on the branch. In the Army, Air Force and Marines, a member's rank determines his or her status, time in service typically, and authority relative to other members. For instance, in the Army, a lieutenant outranks no one in the officer corps. However, in the Navy, a lieutenant is the same rank as a captain in the Army. There are generals and admirals who hold the same rank but are of different services. There are sergeants and petty officers, gunnies, and chiefs all of the same rank and pay grade, but serving in a different branch of service with different corresponding insignia. 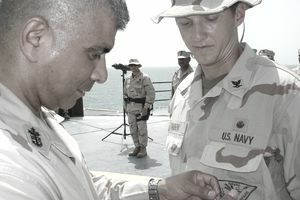 In the Navy and Coast Guard, the term "rate" is used for enlisted sailors instead of "rank" but rate also describes the job or military occupational specialty (MOS) that sailor is qualified to do. The stripes and bars worn on the shoulders of the military uniform denote a person's rank or rate and are called insignia. Enlisted members are trained to perform specialties within the military. As an enlisted member moves up the ranks, he or she assumes more responsibility. Enlisted personnel in certain grades have a special status known as non-commissioned officer status or NCO. In the Navy and Coast Guard, such enlisted are called petty officers. In the Marine Corps, NCO status begins at the grade of E-4, which has the rank of corporal. Warrant officers are highly-trained specialists who have an area of technical expertise, such as a helicopter pilot. They are found in each branch of the military except the Air Force, which discontinued appointing warrant officers in 1959. Unlike commissioned officers, warrant officers remain in their primary specialties to provide knowledge and instruction to enlisted members and commissioned officers. The highest-ranking members of the military are the commissioned officers. While some of them specialize in a given area, many rise through the ranks. A bachelor's degree and in some cases a master's degree is required before an enlisted member can become a commissioned officer. The term "grade" describes personnel and pay functions. Military personnel across the services receive the same base pay, based on their rank or rate and time-in-service. Ranks and rates are named differently in different services, but grades are a universal descriptor across the branches of the military. The lowest enlisted rank in the Air Force is the airman basic. That person is in the grade of E-1 and receives the same basic pay as an E-1 in the Army, who has the rank of private. The "E" pay grade indicates the member is enlisted. For officers, the pay grade begins with an "O." So an ensign in the Navy is an O-1 pay grade, the same grade as a second lieutenant in the Army. For warrant officers, the pay grade designation begins with a "W."
The higher the number within the pay grade, the higher the salary. So an E-4 earns a bigger salary than an E-1. Commissioned officers outrank enlisted members and warrant officers. Warrant officers outrank enlisted members. So a commissioned officer in the grade of O-1 would outrank an Army sergeant major in the grade of E-9. And a W-2 grade would outrank an E-9, but also would be outranked by an O-1.